This ones done a little different than my other posts but I loved the way it was done so much that I couldnt pick it apart in any way! Please welcome Aedan to the blog this week! Good Morrow to ya Allison. Thank you so much for having me visit! I feel like I’ve answered a great many questions over and over again recently, but you’ve given me new angles on some of the tried and true favorites, so let’s begin with “Why do you write?” I write because it eases me, plain and simple. Some people go to the show, some park in front of the tele, others escape into a book…I escape into my head and allow it to carry me away. The act of putting pen to page is cathartic on multiple levels. It assuages my creative drive as well as the need to be doing something, not sitting idly by. The idea that I can weave together the images in my head and put them into something that is digestible to others is a great high, and a great satisfaction, so it fulfills many needs all at the same time. I write part time as I work elsewhere for my livelihood right now. Perhaps one day that will change, but for now it is part time. I have no rhyme or reason to how or when I write; it is usually when I find my mind set. I have told myself the story so many times over before it finds the paper, that when the mental revision is done, I write. I do not find that I need to set word or page count goals either, often the opposite is true in that I have to stop and remember where I left off. I write everything out longhand and transcribe later. I find the feel of the pen across the page is its own meditation of sorts. The typewriter or keyboard is not the same. For all of the above, I don’t feel like I have writer’s block or encounter it often. If I do, it is because I need to revise or add to the story something that I did not have set in my mind. Writer’s block, if I get it, seems to be a by-product of editing calls from the publisher, moreover than my creation of the tale. The next group of answers started with your question about my thoughts on writing a series… I think writing a series is easier in some ways and more difficult in others. 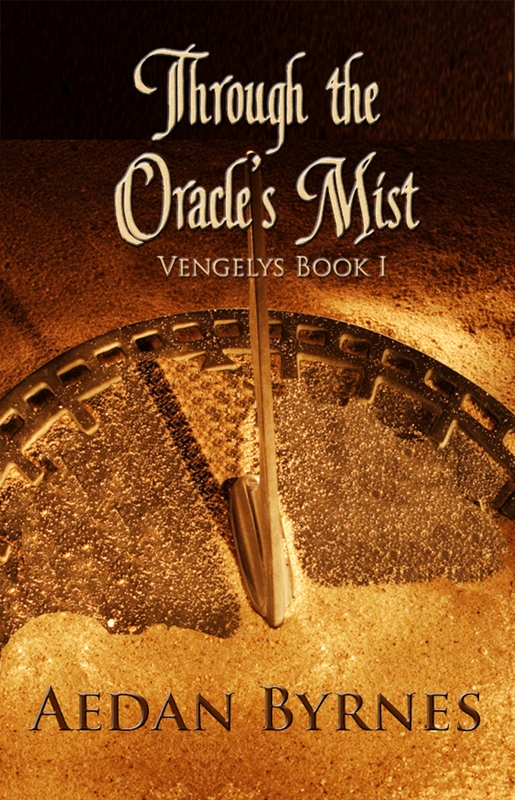 Through the Oracle’s Mist is the first book of The Vengelys (Venn-jell-is) Series. The series is a long tale about a band of warriors from Amaranth, their family, their relationships, their setbacks and the perseverance of spirit over trial. Through the Oracle’s Mist kicks the series off with the tale of Tynan and Cyrenna. It is a story of choices, and chances. It introduces us to the main cast, at least the majority of it, while engaging the reader to make some personal assessments without realizing perhaps that they are. Oracle is a tale about the value of people and the price we are willing to pay to have the things or people in our lives that mean the most. Warrior’s Watchtower is the second book in the series, due out later this year and will be followed by Kingdom’s Fall in 2015. Watchtower picks up from a spot in Oracle to tell the other side of the tale that isn’t shown in the first book, as well as lays the groundwork for the series beyond book three. I can’t give away too much without giving it all away, so let’s just hope I am as successful at detailing it out for the readers as I have been in ferreting it out in my mind. I’ve grown quite fond and attached to this group of renegades. You asked about proofreading/editing and stewing the tale which are all great questions, let’s see if I can make my process make sense. I do a lot of refining of the story long before it hits paper anywhere for anyone else to see. I am constantly editing in my mind; words, phrases, plot choices, story flow…all of it. Once I have that pretty well under hand, and I have kicked the work over to paper, I read the story, and then I read it again, often making minor changes as I go. Once I’m satisfied with it, I transcribe it to computer and send it off to a few Beta-readers for feedback. Some of them will kick back editing notes, some say ‘love’ or ‘loathe’, some say nothing besides, “looks good to me” and some ask questions about pieces that I think I’ve connected since I know the story in my head, but maybe didn’t get across to the reader. All of which are good returns. Once those come back, I go through them one by one and address changes that I feel need to be made based on the feedback. Some go in, and some don’t. At the end of the day it is my story that I’m telling and some things don’t feel right to me. After those have all be fielded I send the copies back out again for a re-read and see what comes back…there is often far less that comes back at this stage. If anything does, I repeat the process, if not, I shelve the story. Oracle sat for five months before I picked it back up. When I pick the story up again, I need it to be fresh. I need it to engage my mind to read what is written, not see the story the way I know it in my head. Thus, it is a concerted effort reading at this point to take in each word as I read it and not allow myself to supplement them with the story I know. For me, there are usually two passes at this point a couple weeks apart. A first pass, edits, and a second pass reading. I will do a third pass if I had major changes, but if not, once these edits are keyed in, I’m done. At the end of this stage, the complete manuscript goes to my publisher and the editor that I have there. I can’t speak to the process there, but I can tell you what I think happens from my side of the messages. Once it is there, they do a complete read through, start to stop. If there are major hiccups to the tale, I think I would hear straightaway and have to rework right off. As it has been, what happens next is they begin a page by page, line by line dissemination of the story for the formatting, word choices, confusions, punctuation, clarifications, and a myriad of other things. I get back a ‘to do’ list of things to consider. If it is a punctuation issue or technical, I get a statement about what was changed. If it is a word choice or clarification, I get a suggestion and have to make decisions about what should be there. I have the right to keep what I wrote, take what they have suggested, or change it altogether. Once the line by line passes have been made and the edits have been completed, I believe they do another complete read to get a feel for the continuity of the tale. Pending any further edits to make, the story then gets formatted in font and we figure out how many pages we need to use so the cover can be made to fit the story. While editing is happening, the cover images are being chosen and the graphics department has kicked into play. The size of the finished product comes together when the formatting is done and the cover size gets finalized. Covers for me are intensely personal. I have a friend who is a whiz with images and I am fortunate to be able to say…’this is the vision I have’ and they will start throwing images back at me to try to fit my vision. As they do, I can refine in my head what I want to see. The cover for Oracle was a bit nerve-wracking because I didn’t understand the process of the font selections, and we went through A LOT of them trying to find the right look for the cover. I knew the image I wanted very early on. The poor folks in graphics likely wanted to throttle me as I was a bit manic to have it all come together ‘just right’ and I could not settle on the fonts. I sent them an idea of what I wanted, and as luck would have it, we had no notion of what the font was to recreate it at the higher resolution needed for the cover…so it was a long process. BUT, what we did do that was absolutely awesome, was we chose fonts for the series, so every cover will have the same lettering style for the title, the series title and the author name. The challenges of the first one took care of them all the way through. Those graphics folks are so smart!That, and my contact with the publisher is amazing at the communication thing which made it easy. They were open to hear what I have to say about how I want my book to look and that is a huge thing. I am most fortunate! I think covers are a piece of the buying decision in that they are the attention grabber. A cover, for me does not sell the book, but instead it is the vehicle that causes me to pick it up and read the synopsis. The same is true of video trailers. We are such a busy society, that anything that can grab you out of your routine, make you stop and consider is a positive thing. It is also the perk of social media to the promotion phase of publishing because a cover can be posted with a synopsis or a short video trailer link and it can be that simple to interrupt someone in something they are already doing and engage them to want to know more. This, to me, is how books sell…it is a visual stimulus that engages our brain to want more information. I have two trailers. I have sent you both links and hope you will share them. One was made for me as a gift from a fan. “Blown away” does not begin to express the overwhelming that happened when I saw it for the first time. I am so grateful to Drake Valley Press for understanding my want to keep that original fan made trailer up even after the official trailer was made. The official trailer was modeled on the fan made one and I think both are amazing. I am not a technology abled person, so I am completely stunned by the creations. I am curious to your thoughts after viewing them…did they grab you? Did they engage you to want to know the story? Share your review with me. Speaking of reviews, let’s talk about them. You asked about my thoughts on good/bad reviews. I, like every author out there, love to get good reviews. I also love to see the bad reviews, IF they are communicative to the reasons why. I am always trying to grow in my craft, a good review that illustrates what a reader likes is valuable…so is a negative review if it can give me the reasons why the story didn’t work for them. Does this mean I will change my writing style or process? Probably not, but it could mean that I will be more aware of my personal quirks and how they affect some readers. I have said openly on my Facebook walls and I think on goodreads too that anyone who cannot give a story of mine at least 3 of 5 stars, I want to hear from them personally. I want the feedback. I want the insight into what threw them and their thoughts on what they wanted to see. Now, lest this comes across wrong, allow me the qualifier…if someone just doesn’t enjoy the story, which happens…or didn’t like the ending (knowing that it is a series and needs to be left open for the next story), I don’t expect to be hammered with a 1 star or 2 star review. I think that it is possible to apply what my mother called the ‘sandwich’ method to a review….the story was interesting, the ending didn’t work for me, but the writing overall was good…for example. To me, reviews are not about bashing that the story didn’t go the way you wanted it to…they are a feedback mechanism to the writer to tell them what worked and didn’t but also to comment the merits of their storytelling, not to tantrum. It is further a place to tell others about a tale. While we tell our good friends the sordid details of near everything, reviews are a way to communicate the merits and shortfalls to complete strangers who may or may not see the same things you do. A review is an avenue to connect, and for me, when explained so I can understand and maybe grow from them, the overall mark is less important than what is said. I still want to hear from readers if the story as a whole falls short and find out what I can do as a writer to make my stories better for them…that won’t change. How do I relax you ask….I just shut down. I am a firm believer in unplugging everything and sitting outside. I could climb, float, camp, hike, or do nothing at all and be completely relaxed from the writing world. As said elsewhere, I’m not technology savvy, so the idea of escaping from it is my bliss. A book can be relaxing too…or if I need to escape the world around me, I write. Last up of the questions is the one about advice for aspiring writers, and the answer is a reprint from an interview I did over a year ago. I believed it then and believe it still. I hope it strikes a chord. BEGIN. Whatever you do or don’t do after that, Begin. There is no ‘THE END’ without ‘In the beginning’. I’ve talked to many folks who are trying to start and the question is always “How?” The answer is, keep it simple. Pick an image and describe it, take a word and make a conversation, choose a voice and write a monologue. Can’t come up with it? Try picking a character you love and write a story for them that hasn’t been told. I am not advocating plagiarism here… I am saying tell the side you have never seen. Choose a villain you love to hate and tell the love story that you’ve never heard. Choose the good guy from the television show and write about his wild and rowdy night on the town. Write something that you would never see for this character as it is completely against their nature as you know them. Once you can do this then start coming up with your own characters and the stories that go with them, but don’t kill yourself and burn out before you get started trying to take on the 300 or 500 page novel from scratch with nothing else under your belt. The 50 Shades of Grey series that came out by EL James started as fan fiction for Stephanie Meyer and her Twilight saga. Does it seem like it’s the Vampires and Werewolves Meyer wrote? I have no idea, I haven’t read them, but what I’m saying is that the idea developed by piggy-backing on something else that was out there, it was a place to jump off from. We all need to find the end of the pier and jump into the deep end somewhere. Just take a few laps in the kiddie pool first. And that goes for every aspect of writing. Guest blog, find a peer group and start seeing editing as a part of the picture, try anthologies if you aren’t ready to solo…whatever it is get out there and start. Whatever path you take, remember that you have to start. Dreaming is that voice inside telling you that there is something there but it can’t do it without you. There’s magic in dreaming and stories too. No matter how good the dream though you still have to get up and take up the pen to tell the tale or it is only ever a dream. You have to take the step toward finding an audience. You have to take the step toward gaining the contract. Take the step. There’s a song out that is more an analogy for life, but the key line is an absolutely perfect observation statement for this….Natasha Beddingfield says, “Today is where your book begins, the rest is still unwritten.” I say, “You are the only one who can change that.” Begin. Awesome Q&A! I agree with your comments, Aedan, about book reviews. I prefer the reviews that are constructive & give reasons for liking, or not liking, a book. Nor do I believe they should be about bashing the author. Just because you don’t like something doesn’t nean you have to be ugly about it. Also, I remember your thoughts for aspiring writers. Still wonderful in reprint.